What a difference four years makes. Back in 2012, many were convinced that the 2016 election would be a battle between Hillary Clinton and Jeb Bush. Instead, America’s interest in the Bush family in recent months has mainly focused on whether they’re voting for Clinton or Donald Trump, the man who destroyed their political dynasty. 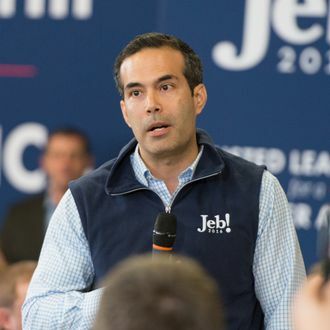 George P. Bush, Jeb Bush’s son, appeared to drop a bombshell in the saddest GOP parlor game on Tuesday night, revealing at a rally in San Marcos, Texas, that he’s the only member of the family voting straight-ticket Republican. He mentioned that his grandfather and uncle, the two former presidents, could “potentially” vote for Clinton. We even know that a number of lesser-known Bushes are Never Trump. The younger Barbara Bush, W.’s daughter, was photographed at a Hillary Clinton fundraiser. Her cousin, the former model Lauren Bush Lauren, announced she’s pro-Hillary on social media. Over the summer, Marvin Bush, brother of Jeb and W., said he’s voting Johnson. It’s like the entire Bush clan is willing to betray their political party just because they think Trump is a terrible nominee, and he spent months relentlessly attacking various members of their family. At least George P. still has some principles.